Visits by Russian companies are always welcome. Generally, they bring such flair and excitement to texts no matter how well over-worked they are in our own repertoire. Moscow’s Pushkin Drama Theatre comes with already very well established ties and credentials for those lucky enough to have seen Declan Donnellan’s co-Cheek by Jowl/Pushkin Theatre Measure for Measure four years ago with its stark, abstract setting and Putin-era echoes. 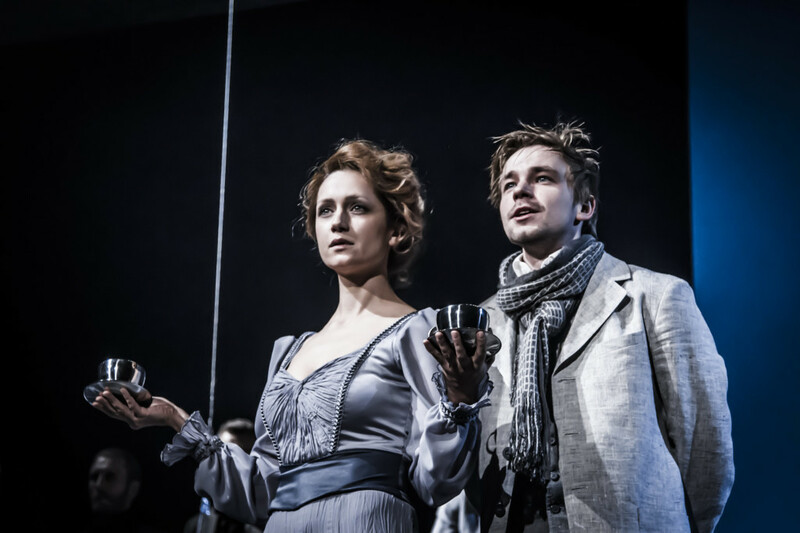 Anyone catching the two performances of Chekhov’s The Cherry Orchard, directed by Vladimir Mirzoev might also feel a similar sense of disorientation. 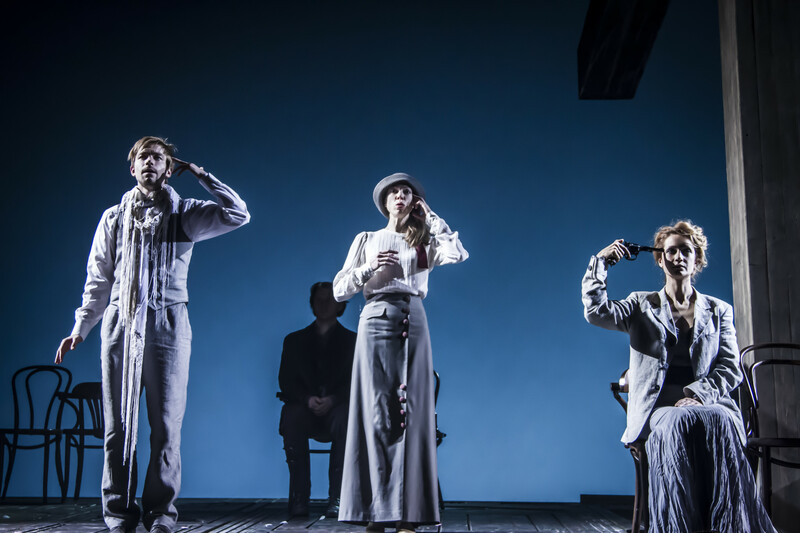 There is nothing remotely familiar in Mirzoev’s stylised, post-modern production to the way English companies play Chekhov. Or, for that matter, past Russian and European companies. Perhaps Robert Icke’s 2016 Almeida Uncle Vanya comes closest to this kind of radical overhauling. But unlike previous Russian productions I’ve seen on film in Stage Russia’s screenings of Anna Karenina, Eugene Onegin, Uncle Vanya (Moscow’s Vakhtangov Theatre) or Satirikon Theatre’s extraordinary, surreal account of The Seagull, Mirzoev settles on understatement rather than the flamboyant energy displayed in the productions above. Indeed, Mirzoev goes out of his way, seemingly, to positively counteract and work against the text in many instances. Thus, where English and other productions might tend to draw individual tragic-comedy out of situations, Mirzoev either displays them as an excuse for a moment of ensemble symbolism or a `straight-faced’ enactment but shorn of emotion. Not that comedy doesn’t arise. Vera Voronkova’s Charlotta, one of Ranevskaya’s roving companions, is a particular success, full of tricks, an eccentric, frantic bundle of enigmatic doubt: `I don’t know who I am or where I came from. Or why I exist’, to paraphrase her. Alexander Petrov, too, as Lopakhin, the son of serfs who ultimately buys the cherry orchard from his former master’s daughter, has his moments – none more so than the announcement of the purchase when he breaks into galvanised dancing. He can’t quite believe his luck. The passing of one era to another. But generally, the atmosphere is downbeat, the effect unemotional, detached which perhaps Mirzoev intended. This is after all a play about languor, apathy and blindness to the future. Chekhov’s portrait of Russian bourgeoisie before the Revolution and the absurdity and refusal of Ranevskaya and her brother Gaev to read the runes, adapt, and replace inertia for work, is always a challenge for a director as to how to balance these opposing rhythms of change and stasis without sending an audience to sleep. Habitually, the English way is often to indulge the emotional-comic, sentimental side so that we feel some kind of attachment to characters who constantly love the wrong person in the wrong way at the wrong time – a very human dilemma. Sadly, for this viewer, none of these feelings arose much during the production’s nearly three hours. I admired, of course, the selfless inter-action of the company. They absolutely work for each other. Victoria Isokova’s youngish Ranevskaya presents a portrait of seductive, cool allure in a household haunted by the past. This is the home, after all, where her son drowned and which perhaps she left because those memories were precisely too painful to bear. Mirzoev suggests as much by including a young boy, her son, playing as a prelude to the production and later interacting with other characters. Naturalism is therefore shunned as is any hint of sentimentality. Rather the director sees it as a `mystical grotesque’ or metaphysical thriller. I’m not entirely sure I understand either description. Chekhov might. I’m sure he would have had a sense of the grotesque arising out of his experience of pre-revolutionary, poverty-stricken Russia with its desperate social inequalities. Now there is a parallel with our own times! If ever there was a portrait of complacency and wealthy indolence with its fateful consequences, it is Chekhov’s The Cherry Orchard. Nonetheless, as revivals go, this was a disappointment. And more, I suspect for those not acquainted with The Cherry Orchard, utterly baffling as to what was going on. Perhaps, had I had a chance to see the company in either of the two more modern plays the company brought for their brief residency at the Barbican – Brecht’s The Good Person of Szechwan and Mother’s Field, based on a story by Chinghiz Aitmatov – I’d have reached a different kind of conclusion. I certainly have the feeling I would. I should add, three musicians add atmosphere and spice but strangely, the programme doesn’t name them. Very odd. Tour produced by Oksana Nemchuk in association with Artsbridge. 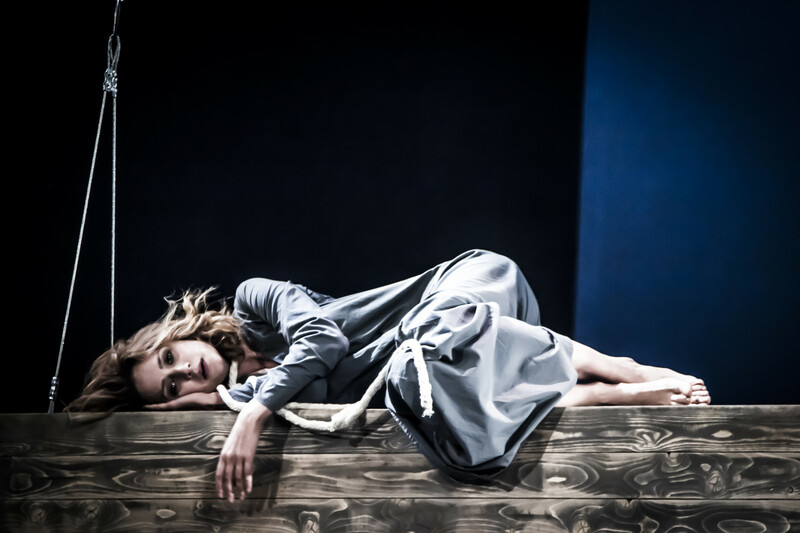 Performances of this production by the Moscow Pushkin Drama Theatre at the Barbican of The Cherry Orchard, Feb 5/6 2019. Followed by Brecht’s The Good Person of Szechwan (Feb 8-9) and Mother’s Field (Feb 9) by Chinghiz Aitmatov in The Pit.